Want to share your scripts in a safe and easy way? Here's how you can use InkTip's sharing feature. First, list a script on the site. Or two. Make sure you upload the script as well. Once you do that, you'll see a "Share" button in the upper left of each script listing. Now, you're ready to create links to share your listing. Once you click the button, you'll be guided on creating two different types of sharing: one to share primarily in email correspondence and the other to share via social media. The above is one avenue where you can use InkTip's sharing. Another area where you can share is by sending queries from the weekly newsletters you receive. You typically receive 2 requests from producers (also known as leads) with the free version. But even better than the free InkTip newsletter is the Preferred Newsletter: subscribe and you'll receive at least 6-8 requests for scripts each week. 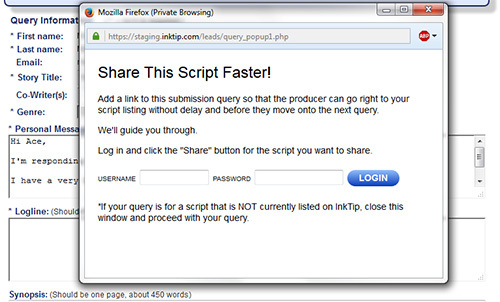 When you submit queries through InkTip, you may have noticed that if you click on the "Logline" area, you'll see a popup asking you if you'd like to log in and create a sharing link for your pitch. That way, when readers check their InkTip queries, they can click on your sharing link, which will take them to your script listing. NOTE: If you have never seen that popup before when submitting queries, it's possible your popup blocker is hiding it. Disable your blocker when you're on this page. Any viewings that originated because you shared a link will be highlighted in yellow on your viewings page.